Full details on Not Fade Away can be found on the Quilt Alliance website here. Tickets are available for the full conference, Friday only, Saturday only (full day or morning only) and even a Home Ticket option that gives you access to most conference sessions via videos distributed after the event. Quilt Alliance members receive a discount on tickets. Today on the anniversary of the 9/11 attacks, I’d like to share video footage of the Quilters’ S.O.S. – Save Our Stories (Q.S.O.S.) interview with pioneering fabric designer, quilter, teacher and entrepreneur Jinny Beyer conducted by eQuilter.com co-owner Luana Rubin at our Not Fade Away conference held July 20, 2013. Q.S.O.S. 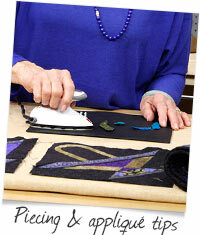 is the Quilt Alliance’s oral history project about quiltmakers. Volunteers all over the U.S. and abroad have interviewed more than 1,200 quiltmakers for this project since 1999. The collection is presented via written transcripts and photographs on the Quilt Alliance website and is permanently archived at the American Folklife Center at the Library of Congress. On occasion, we videotape Q.S.O.S. interviews to demonstrate how powerful these interviews are how important the project is. Watch these interviews along with other stories of quilts and quiltmakers on our Quilt Alliance Youtube channel. All Q.S.O.S. interviewees are asked to bring with them a “touchstone” object (usually a quilt) that has a special meaning to them. Some people choose to bring their first quilt, some bring their first award-winner, and others choose quilts associated with life events–celebration, comfort, love and loss. Jinny’s touchstone quilt, titled “Windows,” is a large hand-pieced and hand-quilted mosaic quilt made from fabrics she designed, inspired by Italian floor designs and in response to the terrible events of 9/11. Jinny Beyer with her quilt, “Windows,” on July 20, 2013 at the Not Fade Away conference in Herndon, Virginia. On the morning of September 11, 2001, Beyer was packing for a trip to Italy to gather inspiration for a quilt to be shared at her annual quilt seminar when a friend phoned to let her know of the attacks. Her trip was canceled and Beyer learned that a good friend had been lost in the Pentagon crash. Regrouping, she began to design a mosaic quilt that would feature the colors and icons that become so prevalent in media coverage of the events–the ash and dust of the wreckage, and the American flag. Jinny shares the story on her website here. Watch the Q.S.O.S. interview to hear Jinny’s story. Anyone can download the Q.S.O.S. manual and interview a quiltmaker in their community. Volunteers work independently to add interviews to Q.S.O.S. sub projects, including 43 state projects, 14 organizations (museums, institutions, regional quilt groups), 8 guilds and 9 country projects.